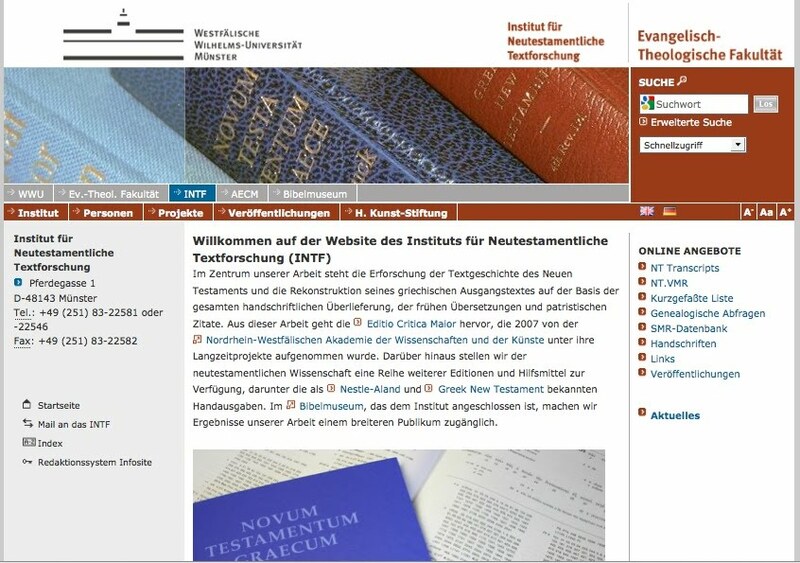 The press release today given at the 3rd Lausanne Congress says that the Updated NIV is going to be available electronically from November 1. I don't know what the textual decisions of the Updated NIV will be. However, the first text I'll look up will be Mark 1:41 to see whether they support the NIV 'Filled with compassion' or the TNIV 'Jesus was indignant'. I've just finished an article which I think deals a blow or two against the reading orgistheis here, but if I were a betting man my money would be on an agreement between the Updated NIV and the TNIV here (Note: ETC does not support betting). Anyway, it would be good to get some running commentary on ETC on textual decisions of the translation as we become aware of them. I am not quite sure what the Updated NIV will be called: surely not the UNIV or uNIV. Anyway, the way users will distinguish between the old and new NIVs may not be entirely in the publisher's control. Basically Williams argues that previous discussions of the style of the Long Ending have been methodologically unsound. So he proposes a sound method and procedure (or methodological procedure), applies this to the evidence (well, half of the evidence), and proposes that the style of the Long Ending is distinctly non-Markan. So no surprises there then. Interestingly he states: 'due to spatial limitations and the fact that dissimilarity reveals more about authenticity than similarity, our discusson will be confined to strong indications of an un-Markan style plus instances that have wrongly been labelled un-Markan' (p. 404). This looks like dealing with only half the evidence to me. In his article Travis Williams addresses co-blogger Maurice Robinson's own study of the Longer Ending of Mark (LE) in Perspectives on the Ending of Mark: Four Views (ed. D.A. Black; Nashwille: B&H Academic, 2008), 40-79. (The other three views are those of D. A. Black, Keith Elliott and Daniel Wallace). Look inside the book here (Amazon). I selected this book for the Eisenbrauns/ETC sales which is still up. Robinson has now written a response to Williams which will be published in two parts (the full response will eventually be published under TC-Files). Since my own study of the Longer Ending of Mark (LE) is addressed in Travis Williams’ article (“Bringing Method to the Madness: Examining the Style of the Longer Ending of Mark,” BBR 20.3  397-418), I consider it valid to offer a brief comment. I suggest that this study, like most others claiming to deal definitively with matters of style and syntax, remains flawed, and serves only to further muddle the discussion. Among the many fallacies that could be noted, I select five that occur in close sequence in the middle of the article (Williams, 406-411), in the order they occur. 1. Williams claims (406) that the unique use of ἕτερος in 16:12 is out of step with the exclusive Markan use of ἄλλος. This is supported by a footnote (406n23) that points out a supposed Markan failure to differentiate between different types of seed in the parable of the sower, claiming on this basis that “Mark uses the term [ἄλλος] to denote both ‘another of the same kind’ as well as ‘another of a different kind.’” This is supported by mention that the Lukan parallel uses ἕτερος in place of the Markan ἄλλος, concluding that “this reveals that Mark prefers ἄλλος even in situations in which another term may have been more specific.” But such a line of reasoning simply is incorrect on two major grounds: first, one cannot make Lukan word preference a touchstone for Markan style and usage (this particularly if one holds to Markan priority! ); second, the seeds in the Markan version of the parable in fact are not different — rather, the same type of seed is merely sown in different soils. Within a proper Markan context, ἄλλος then remains the only appropriate term for the Sower, whereas in 16:12, ἕτερος is clearly required. This then becomes a non-issue. 2. Williams claims (407) that the absence in the LE of such a “distinctive Markan stylistic feature” as the term εὐθύς is “glaring,” and that “it is striking to find it absent from the Long Ending.” Yet there are many long stretches of Mark in which εὐθύς does not occur that extend far beyond the 12 verses of the LE. Examples include 2:13-3:5 (20vv); 3:7-4:4 (33vv); 6:55-7:34 (37vv); 8:11-9:14 (43vv); 9:25-10:51 (78vv); 11:4-14:42 (154vv), etc. In fact, even in the portion up to 16:8, the last appearance of εὐθύς was in 15:1 — some 55 verses earlier! Obviously Williams’ claim on this point is seriously flawed. 3. Similarly, Williams also claims (407) that the absence of πάλιν in the LE is “glaring,” since such is “another favorite of Mark.” Leaving aside the fact that πάλιν is far more characteristic of John, indeed Mark does hold second place among the four gospels in the use of this word. However, the same facts apply as in the case of εὐθύς: numerous long stretches exist in Mark in which παλιν simply does not appear. Examples include 1:1-2:1 (45vv); 4:1-5:20 (60vv); 5:22-7:31 (109vv), etc. And once more, even in the portion up to 16:8, the last occurrence of πάλιν was at 15:13 — some 42 verses earlier. Once more, Williams’ claim is flawed. Proposals are invited for papers of 30 or 45 minutes on this topic. Suggestions for workshops, presenting work in progress, are also welcome. These, and any enquires, should be sent to Hugh Houghton. 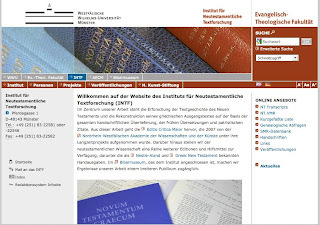 Eisenbrauns has a list of textual criticism books available at 15-40% discounts. Tommy Wasserman helped select the books for the sale too! Looks like bargains galore to be found!! Update: Yes, I (TW) suggested to James Spinti, Marketing Director of Eisenbrauns and a regular reader of this blog, that they run a sales on some TC paperbacks, and specifically James Royse's monograph, which is just out in paperback (see previous blogpost). Eisenbrauns now offer it for $67.46 – now that is a bargain! Since Eisenbrauns is the only publisher in the world (sic!) which have my own book on the textual tradition of Jude in stock, I am also happy that it is included in sales every now and then. About a year ago, I was contacted by SBL Editorial Director Bob Buller who had read with interest my blogposts from the SBL 2008 book review session SBL24-129 in which James Royse's recent monograph Scribal Habits in Early Greek New Testament Papyri (NTTSD 36; Brill, 2008) was reviewed. You can find links to the seven blogposts here . The full text presentations from this SBL section are available under TC-Files in the right sidebar. Bob also noted the subsequent discussion about the high price of the Brill edition. In fact, the very first remark in the comments to the first post was made on this point by Wieland Wilker: "The real shame is that this phantastic book is so expensive! 310 Euro! $ 369! Come one! This book belongs into the hand of every NT scholar." Buller told me he was intrigued with the idea of making this work available in an SBL paperback. On the other hand, he was worried that SBL would end up with a lot of very expensive copies sitting in a warehouse, if the demand was not so great. We discussed the matter and I wholeheartedly recommended the enterprise. Now I can tell you that the SBL paperback edition of Royse's monograph has been announced here and it costs $89.95 (i.e., under 1/4 of the harback list price). 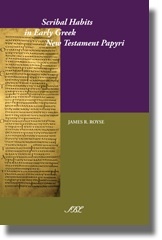 Now, that is still a lot of money for a book, but then you must keep in mind that this one is over 1000 pages long, and, as Wieland said, it belongs into the hand of every NT scholar! In our conversation Bob Buller also asked for recommendations of other Brill books that would be worthwhile for the SBL to publish in paperback. Any suggestions? On the lighter side of things, America's Finest News Source has published an article on a recent National Geographic-sponsored controversy on the ancient world, here. Apparently, the textual tradition of the Iliad is not as reliable as once thought. I am informed by Paul Anderson that with others he has just launched the Center for the Study and Preservation of the Majority Text: www.cspmt.org. The site is currently under construction. I'm not exactly sure what the 'preservation' will be, though perhaps it is in part defence. The most historically informative section may be the details of Byzantine families when they are uploaded. One gets a sense of the ethos through the interesting collocations in the In Memoriam section, which lists the perceived heroes of the cause. Interesting article in the recent Bulletin for Biblical Research: T.B. Williams, ‘Bringing Method to the Madness: Examining the Style of the Longer Ending of Mark’ BBR 20.3 (2010), 397-418. Readers of this blog may find it useful to be able to link to a certain MS in the List of MSS in the Virtual Manuscript Room (Münster). Martin Fassnacht recently told me that he had broadened this possibility.